Since 2006, aden + anais® has brought the Australian legacy of 100 percent breathable cotton muslin to the forefront of modern baby care. Offering signature products that combine comfort and safety with style and affordable prices, our award-winning collection includes a full range of multi-purpose products. 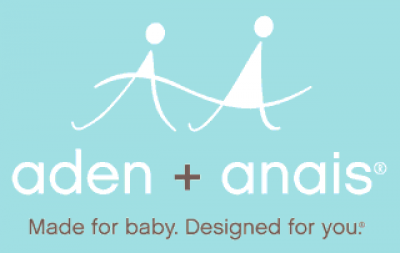 From swaddling wraps, burpy bibs®, dream blankets® and security blankets to sleeping bags, skin care, and the latest serenity starTM, an electronic feeding and sleep system, aden + anais aims to improve the lives of new parents and caregivers, everywhere, in a simple, beautiful way. Founder Raegan Moya-Jones is recognized for bringing global awareness to the many benefits of swaddling and the use of cotton muslin. She is also the author of “swaddle love,” a book on the art of swaddling and the creator of the aden + anais swaddle love foundation, which focuses on eliminating touch deprivation of orphaned babies across the world.